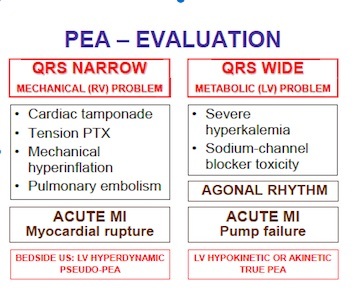 Begreppet innebär QRS-komplex på EKG med samtidig avsaknad av puls. Bedöm QRS-durationen, dela in i smala och breda komplex. Blockerade natriumkanaler/intox – Natriumbikarbonat (50 mg/ml, 200 ml ges iv under 10 min). This entry was posted on lördag, augusti 1st, 2015 at 1:07 and is filed under Kardiologi, Medicin. You can follow any responses to this entry through the RSS 2.0 feed. Both comments and pings are currently closed.